Dylan Coburn Grey explores the creative relationship between Le Corbusier and experimental composer Iannis Xenakis. 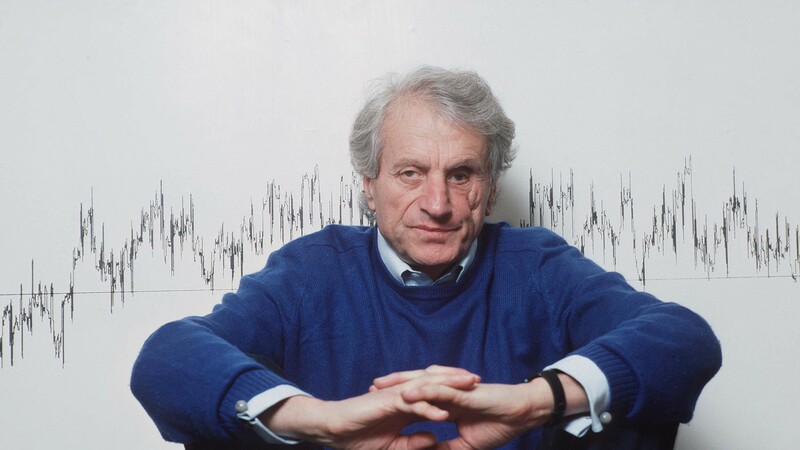 Iannis Xenakis’ life story is an Oscarbait biopic waiting to happen. He memorised Mozart’s Requiem in its entirety before he was sixteen; aged eighteen, fighting in the Second World War, he got hit in the face by an unexploded shell which nearly killed him; alive but blind in one eye, he nonetheless graduated as a civil engineer in 1947; having graduated, he fled to France to avoid being imprisoned in a concentration camp by the new Greek government. A busy old time of it, all in all. 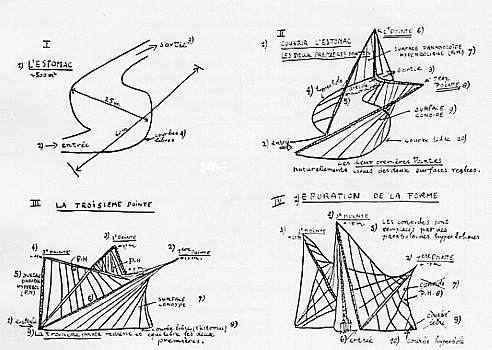 Xenakis settled into his new French life with a job in the Le Corbusier architecture studio. He also became a world-famous avant-garde composer, presumably out of boredom. After being shot in the face by a tank, I’d imagine that any job is something of an anticlimax. Architecture and music are, at first blush, not at all alike; Xenakis was an interesting man – all fighting and cussing aside – because he approached them in the same way. This is not conjecture; the man himself was very helpful and laid out his philosophy of music in the 1960 essay, Free Stochastic Music. Central to this essay is a disaffection with the dominant musical trend of the time, towards musical structures which were rigorously worked out but sounded random. Xenakis, in contrast, argues that the moment-to-moment action of a work can be semi-random once the global trend is determined or directed. Metastaseis B, a composition of his from 1953, illustrates how this might be applied to music (and eventually architecture). I do recommend you listen to this one, if only because it treats pitch in a novel way. The global form is determined not by specific pitches and pitch events, but by an overall pitch profile which rises and falls. The profile in question outlines a geometric body called a hyperbolic paraboloid, which sounds scarier than it is. ‘Pringle-shaped’ means the same thing in five fewer syllables. In Figure 1, you can see that the HP is drawn between sets of points on parallel planes. On both those planes, the points are generated by iteration of an up/down and left/right transposition, and the two planes’ respective algorithms are independent of each other. 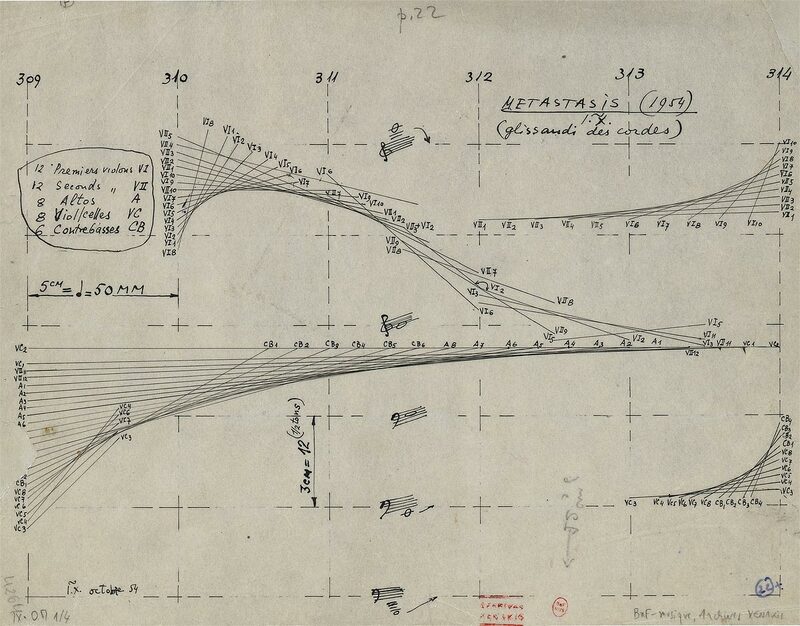 Pitch, as already mentioned, is one of the ‘planes’ in which Xenakis plots points. If you listened to the opening of Metastaseis, you’ve heard another musical parameter with which Xenakis draws curves: volume. 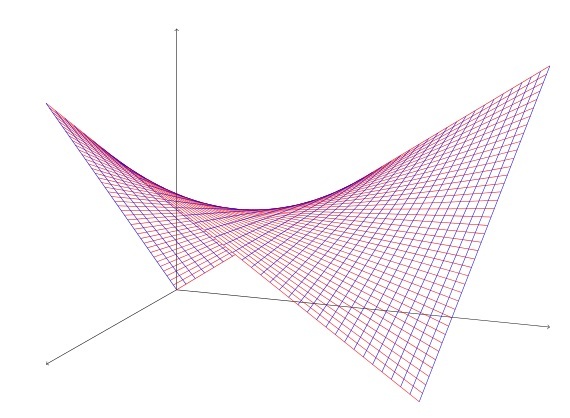 We know, too, that he thought in terms of paraboloid curves because the score looks like this. Figure 2 shows how pitch and volume both tend upwards but operate at distinct rates of change, meaning that the resultant sound-shape is perceptible but not entirely predictable. Global complexity arises from the interaction of simple, local, operations. This type of micro-macro relationship is what allowed Xenakis to make his music formally coherent in the way he wanted; because every sound we hear in Metastaseis realises this global structure, it is simultaneously structural and sensual, functional and decorative. Here, Xenakis parallels architect Louis Sullivan’s dictum that ‘form follows function’, for all that music is not literally functional in the same way as a building. You can’t hold a meeting in Beethoven’s Ninth. A reductive take on this idea might characterise it as anti-beauty, because it is anti-ornament; at least as far as Xenakis goes, this is inaccurate. Rather, as discussed above, beauty needs to be integrated into the work, rather than layered on top of the nuts and bolts. There is reason to believe, too, that other besides Xenakis felt what Sullivan articulated. Roughly around the time of Metastaseis, Polish architect Arsenius Romanowicz designed the Warsaw Ochota train station with a single, hyperbolic paraboloid curve as its roof. The shape is not significant or Modernist per se; I’m not going to try prove that Pringles are an instance of form over function. In this instance and time period, though, it is indicative of the criteria the designer is bringing to bear. A smooth, interesting surface is created from the interaction of straight beams, without any ‘added’ ornament; it’s not just that it’s functional and sensual, the functional is sensual. More relevant and more famous, perhaps, is a Le Corbusier design which also centres on the paraboloid; moreover, Xenakis was instrumental in its conception. The Philips Pavilion was intended as a celebration – by the Philips Corporation – of post-war technological advances, to be filled with sound and visual art. It is contemporaneous with Metastaseis, and exhibits the same kind of gradual organic change as the musical work. This is not coincidence; as a comparison of Corbusier’s sketches (below) with the score (above) illustrates; they are remarkably similar. In Figure 3, as with Metastaseis, the decorative aspects of the design arise naturally from the structural aspects. And now for the twist: it’s not just the same type of geometric body they share, building and music are both based on the same algorithm. They use the same co-ordinates, the only difference being that one is plotted in architectural space and the other in musical time. Looking at the Pavilion, we see Metastaseis; listening to Metastaseis, we hear the Pavilion. 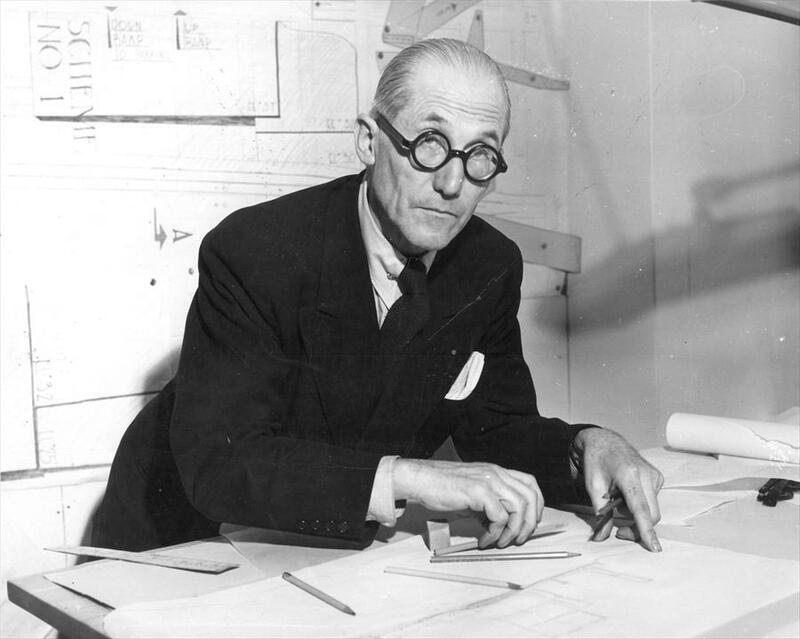 Fig 3 – Corbusier sketch.